The breadth and depth of Rhode Island’s creative landscape is considered one of the state’s greatest assets and one of the most vibrant in the United States. The Rhode Island Arts and Culture Research Fellowship is designed to research, write, collect and connect stories of significant visual artists, performers, and writers past and present who have lived in Rhode Island to inform and inspire. The project will enhance Rhode Island’s reputation as a creative destination, create a vital bridge between the past and present, connect arts and cultural communities, represent diverse backgrounds, and catalyze education focused on arts and culture. The Rhode Island Council for the Humanities is administering this Fellowship and convening a diverse Advisory Committee made up of cultural leaders to help guide the project’s development. This initiative is made possible with a gift from Yarrow Thorne. “I am pleased to support this opportunity to showcase the nexus of creativity that’s long been part of Rhode Island’s DNA.” Thorne is the founder and executive director of The Avenue Concept. The RI Arts and Culture Research Fellowship will utilize the Wikipedia platform because it is the top web-based knowledge database and destination for a wide range of users seeking information. Research will focus on post World War II to the present, but the project may include some thematic entries connected to earlier periods, tracing the roots of the state’s literary culture, for example, or the strong historical connections between women and design. Janaya Kizzie has a strong background in activating archives and engaging diverse and creative populations. She was selected from an impressive group of over 50 applicants from New England and beyond for her archival experience, knowledge of the arts and culture sector, and digital humanities. Janaya assisted in the establishment of archives at the American Academy of Arts and Sciences in Cambridge, Massachusetts, and Citizens Bank. In 2018, Janaya organized the new AS220 Collection at Providence Public Library. 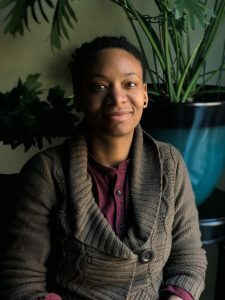 An artist and writer herself, Janaya served as co-director of Frequency Writers in 2015-2016, and her work has recently appeared at Providence Fringe Fest and Creature Conserve’s Urban Wildlife Exhibit. She has a bachelor’s degree in Creative Writing and History from Bard College and a master’s in Library and Information Studies from the University of Rhode Island. 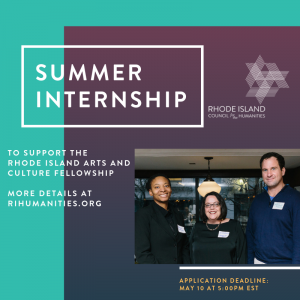 The Council is currently accepting applications for a summer intern to support the Rhode Island Arts and Culture Research Fellowship. Position requirements and more details available here.